Well, it’s been a while. I’m so sorry for my delay. But I don’t want you to think that I’ve been out of touch with food, because I have been very well in touch with feeding my appetite. Let’s get back into the swing of things, shall we? I was warmly welcomed here in Atlanta when invited to join fellow bloggers and writers at the Seasons 52 Autumn menu release. I’ve done these tastings before in Indianapolis, specifically referring to the last Autumn tasting, and have always had a great experience. The wine, the food, the service. All have been fantastic, so I expected a similar experience here. My favorite dish of the night, the rustic smell of the grilled chicken was intoxicating. Pockets of vinegar burst with each bite of the salad, as crisp celery and apples dabbled through the salad giving it a crunchy texture. There was a sharp bite, not only from the vinegar, but also from mustard seeds. Pumpkin seeds gave it a bit more crunch, but I wished there were a few more as I was hunting for those and the dried cranberries. The chicken was extremely tender and full of flavor from the grill, it was a perfect fall dish. I was slightly overwhelmed by mint with this course, as it was ruffly chopped in the salad. Mixed in were apples, butternut squash, and crunchy walnuts. The duck was tender though done a bit more than I would have preferred. 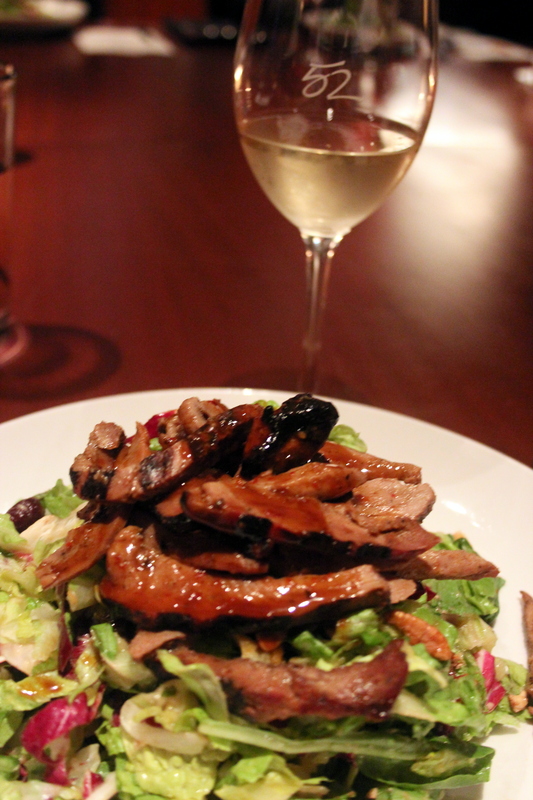 I really loved the ginger soy dressing that dressed the salad. The presentation was great though I believe this is how many of their salads are presented: in a cylinder that is then ‘poured’ on your plate. I felt this was almost a fun play on a typical waldorf salad, just a bit more modern and delicious finishing with a black pepper taste. Piedmontese steak is a leaner cut of meat that I don’t eat very often. This dish showcased all the reasons why one should enjoy every morsel more often. 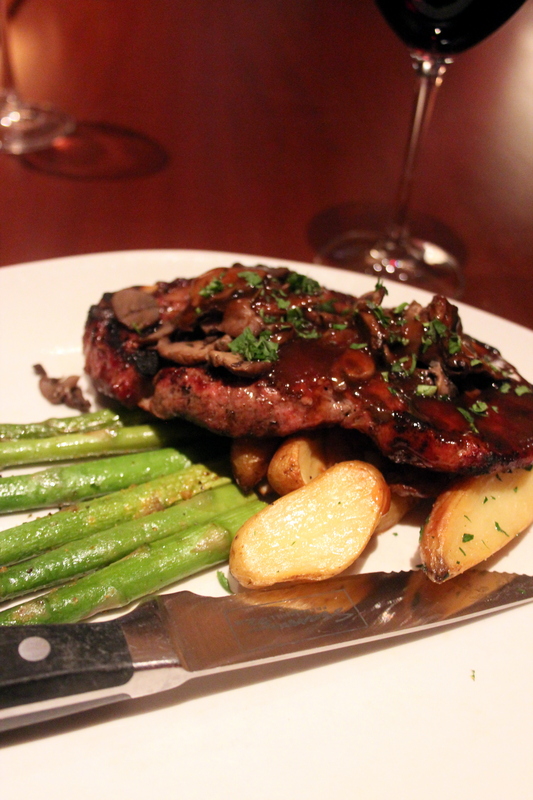 Though it was lean, it wasn’t lacking any flavor as it was grilled perfectly, covered in a creamy, rustic mushroom sauce. The potatoes were wonderful, never skipping a beat as they were properly seasoned and tender – all without a drop of butter. The asparagus was crisp and well seasoned, a great accompaniment to the plate. 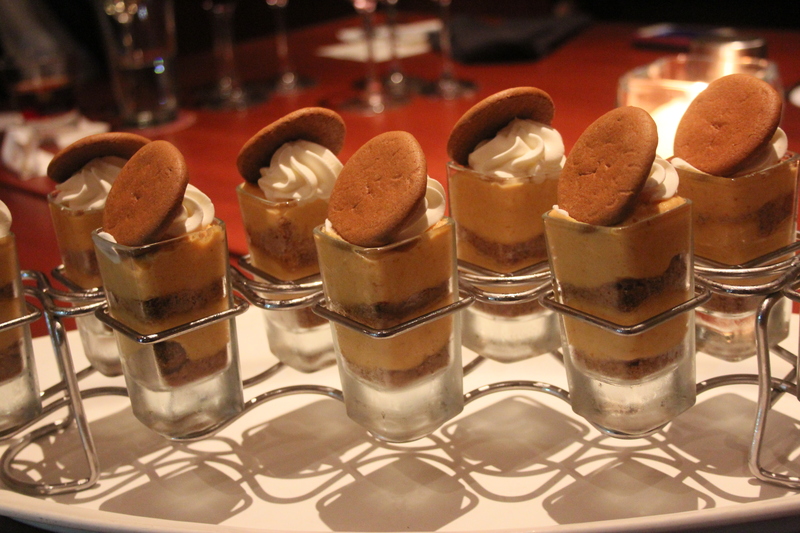 I think I’ve said it before, but dishes like this make people forget that the meals at Seasons 52 are calorie savvy. 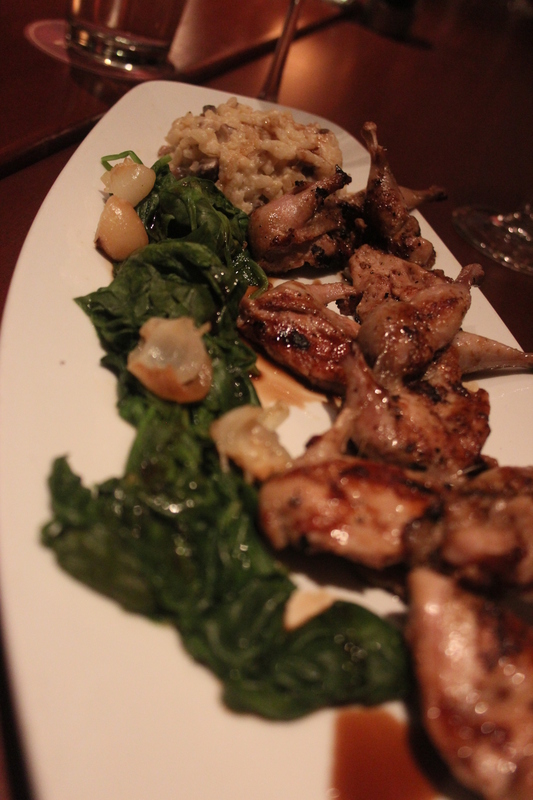 Another delicious dish, the quail was perfectly tender and rich in texture and taste. I wanted to pick up each piece and nibble it to the bone, but didn’t think that was the best way to present myself to this new crowd. The charcoal smell made me close my eyes in happiness as the quail was buttery and rich while maintaining a clean finish. The portabello risotto was rich in flavor due to a drizzle of truffle oil throughout the rice. The portabellos made the risotto ironically meaty in texture and substance, all melted together perfectly with the balsamic reduction glaze. Just as I remembered, the mini indulgences were the perfect way to end the meal. A little bit of pumpkin cream, graham cracker filling, and a gingersnap cookie had me leaving on a happy note as I liked my spoon clean of the pumpkin pie treat. The other bloggers and writers were nice and curious about me, the new comer. I look forward to reading more about their experiences, suggestions, likes, and dislikes as I continue to settle into this new community. 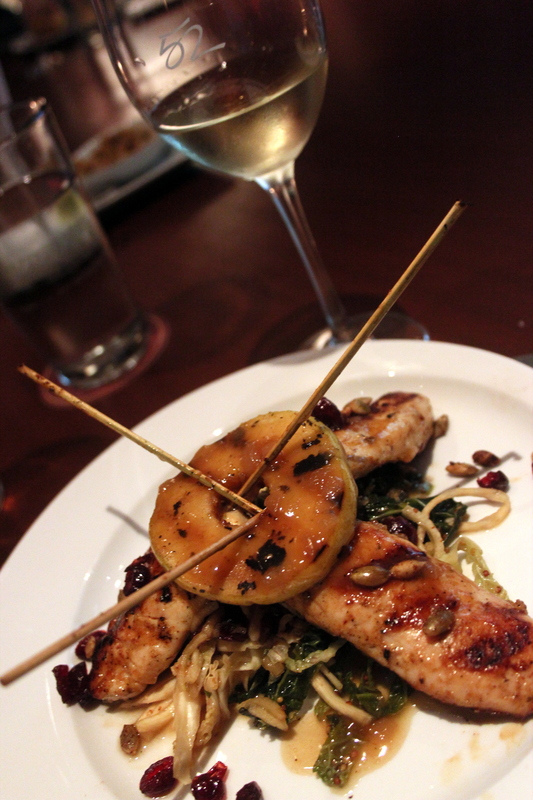 Thanks again, Seasons 52, for a delicious evening of wine and nibbles. Cheers to the new adventures, and your seasonal menu. When thinking up City Nom Noms, I purposely avoided calling it anything Indianapolis related. I did this because I knew I wasn’t going to be living in Indy forever. I didn’t know when a change would happen, I just knew it would. And that time is now. For those who don’t follow me on twitter or haven’t seen this announcement elsewhere, I’m sure you were thinking that something was happening (or that I just gave up on blogging. Honestly, I haven’t given up eating!) Well, something has happened in mine and hubs life – we have made a move to Atlanta. Yes, HOTlanta. This Wisconsin native and northern lady has packed her bags and accepted a new job with a company based out of Atlanta. You can read more here, but just know that there are many restaurants I’m going to miss in Indy. So many great (and yes, there were some not so great) times to be eaten in Indy. The scene is booming and there are many restaurants and chefs that I will miss because of their greatness. For all the reasons I’ll be missing the food, they are the same reasons I’m excited about this new adventure. After all, it isn’t just about the excitement of the new job, new city and new home. The culinary adventures that lie ahead are so exciting as there are many I’ve been wanting to try. Richard Blais does live here after all. Can’t. Wait. What does that mean for City Nom Noms? Well, I’m going to keep writing. Obviously, the focus may shift to Atlanta, but I’ve always written about trips and my travels around the country. I’ll continue this trend, but know that you’ll see a big shift from Indy to Atlanta area. Thank you to all of my readers for this past year. I hope that you keep reading and continue to utilize City Nom Noms as a resource in the future. And, in case you were wondering, The Local for my last meal when I was in Indy. Delish. And my first restaurant here in Atlanta? I’m visiting Flip tonight. Stay tuned…here I come Richard! Over at Disney Food Blog’s new(ish) podcast, episode one discusses ‘jaunts’. Quick trips that you can access from the parks, thus getting a break from the crowds and the heat, plus getting something other than chicken tenders and hamburgers. A quick boat ride to the Fort Wilderness Campground had us at Trail’s End. The restaurant wasn’t busy at all and we were quickly seated. Hubs ordered a pulled pork sandwich, which has a surprisingly tangy barbecue sauce which I really enjoyed (yup, I steal bites on vacation too). There was a corn bacon slaw on top, but really, the taste of bacon was lacking though the sandwich overall was great. 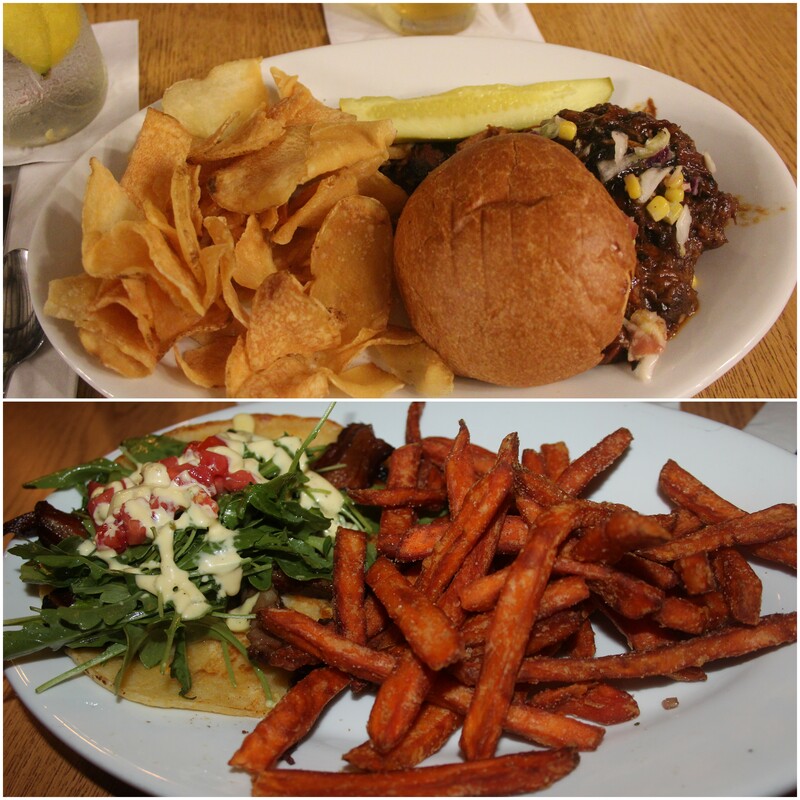 I had ordered an ‘open faced Johnny Cake BLT’ with a side of sweet potato fries despite looking forward to the fried chicken. But, I didn’t regret it at all once I took a bite. A corn based pancake topped with bacon, arugula and tomatoes. There was a peppery mayonnaise on top too – and when all those flavors combined, all I can say is wow. It was something I would have never imagined eating at The World and was beyond tasty. Beats a burger at a stand anytime surrounded by a crowd. Highly recommend – though I do hear their chicken is great, as is their breakfast buffet. The Polynesian Resort is beautiful, full of lush florals and vegetation in the lobby. Honestly, I haven’t been to Hawaii but it is everything that I imagine it to be. So when we sat down at Kona Cafe for lunch, I wasn’t surprised to see all of the great Polynesian food, and I wanted to get my hands on all of it. Hubs settled on barbecue pork tacos. Visually, I was surprised to see the homemade tortillas be so thick. But, it was still a great taco and hubs gobbled them up. I ordered the Ahi tuna sandwich. I absolutely loved the sweetness of the pineapple bread the sandwich was served on. The tuna was thick and seasoned well, but cooked a little bit more than I would have liked. But the pickled vegetable slaw and bread made that sandwich very good. The sweetness of the bread played really well with the vinegar of the slaw, though it did kill the overall flavoring of the fish. And of course, sweet potato fries were great as always. Before heading home, we ducked into The Wilderness Lodge for a bite to eat. We decided to eat a few appetizers between each other, though there is an all you can eat type of barbecue lunch that looked appetizing (and what they are known for). We started off with queso and chips, which was nothing too fancy. Though small and minor, I did like the fact the chips were sprinkled with tomatoes and green onions. No idea why, I normally don’t go for that flair, but alas, I liked the extra nudge that pushed it towards nacho type. I had a salad, which was dressed in a really light apple vinaigrette. I mainly ordered it because of the candied walnuts. It was much bigger than I anticipated, but there wasn’t anything too special about it. Hubs ordered the smoked salmon, which he thought was a little dry and anticlimactic. 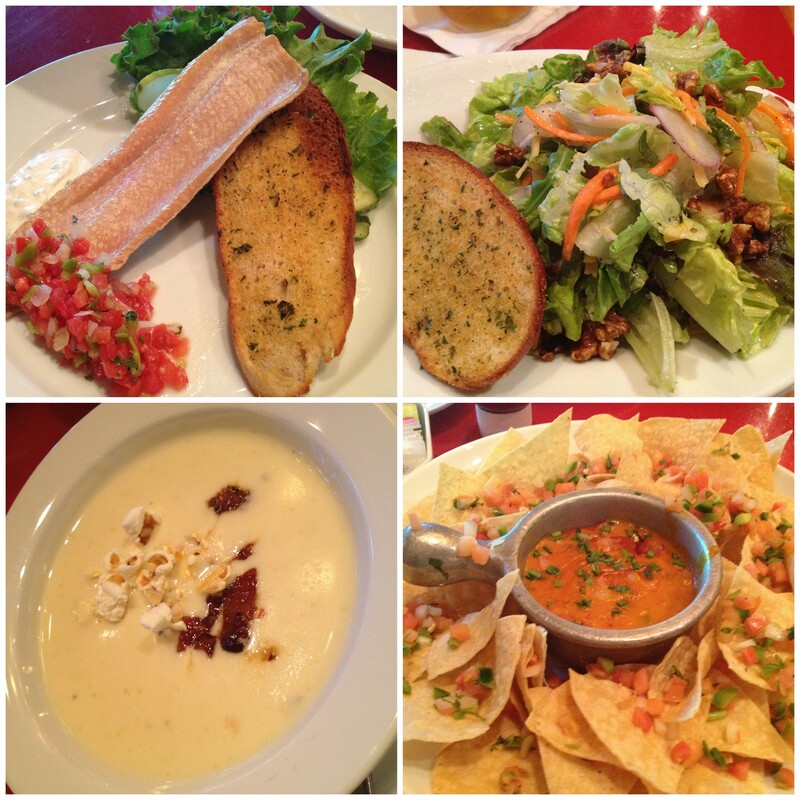 Though all of this was okay and standard, I couldn’t get enough of the cheddar cheese soup. It was creamy, decadent and so tasty. I absolutely loved the sharpness of the cheddar. And to make it even better, popcorn and bacon. Candied bacon gave it a slightly sweet bite through the sharpness, while the popcorn was just fun. I loved it. I ate it so fast, maybe that’s why I didn’t enjoy the other bites because I was so focused on that soup. Next time, soup and barbecue. All of these were great choices for us to try while enjoying the parks. We did eat in the park at one point, but it was in Epcot where I have a little bit more love for due to the country and ethnic drive of the food. Though all of it isn’t spectacular, I still appreciate it a little bit more as there are more options than the other parks (though if you recall, the Animal Kingdom does have a great restaurant). Eating new (and great) food is always an important piece of our vacations – what about you? Anything you look forward to when on vacation? Once again, congratulations! Email me at angieahrens@gmail.com with your name and address. I’ll drop your gift card in the mail as soon as possible. Thank you to all of you for your great comments. I appreciate you reading! I normally wouldn’t review a chain, let along one that is fast food. But when Chick-fil-A reached out and asked me to give their restaurant a go because of their new desserts, I decided to say ‘absolutely!’ Why? Let me tell you. A reason to eat a spicy chicken sandwich. 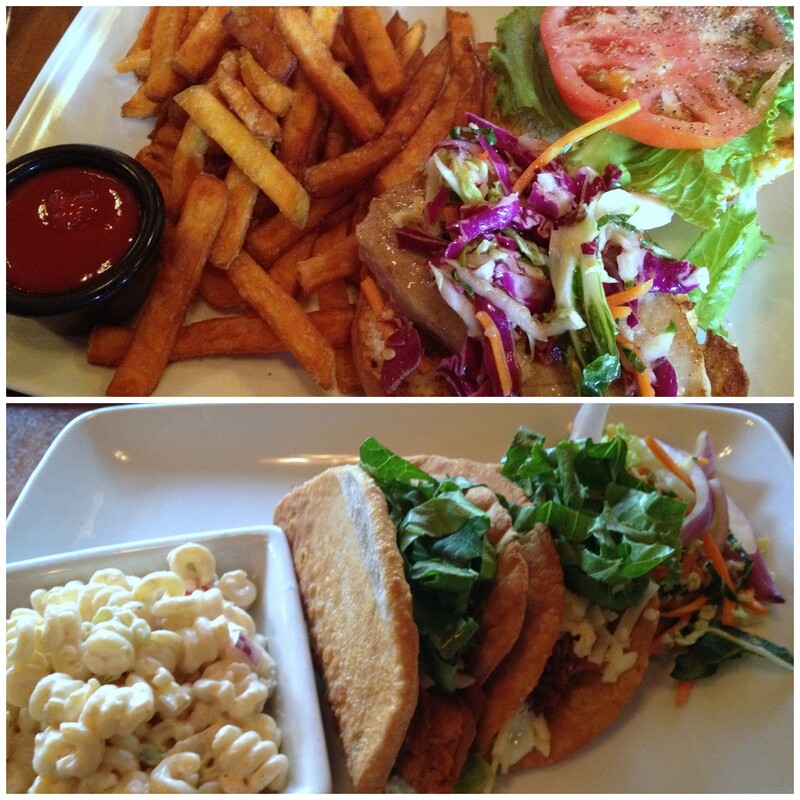 Eating out at lunch is rare, especially fast food. So an excuse to have the spicy sandwich was accepted. I like that it is a tender chicken sandwich with subtle, spicy breading. The end pieces are crispy, but most of it is barely covered with the thin breading. Plus, a pickle ends it well for me. I like chocolate. The whole reason was the try desserts. And I’m not one to turn down some ice cream, cookies, and brownies. Desserts for you! Yup, you heard me. YOU can get these wonderful desserts yourself. But of course, I had to try them first. After I noshed on my chicken sandwich and waffle fries, I gave the cookie sundae a try. A chocolate chunk cookie was broken up in the bottom of the cup and topped with soft serve ice cream. Vanilla I may add. 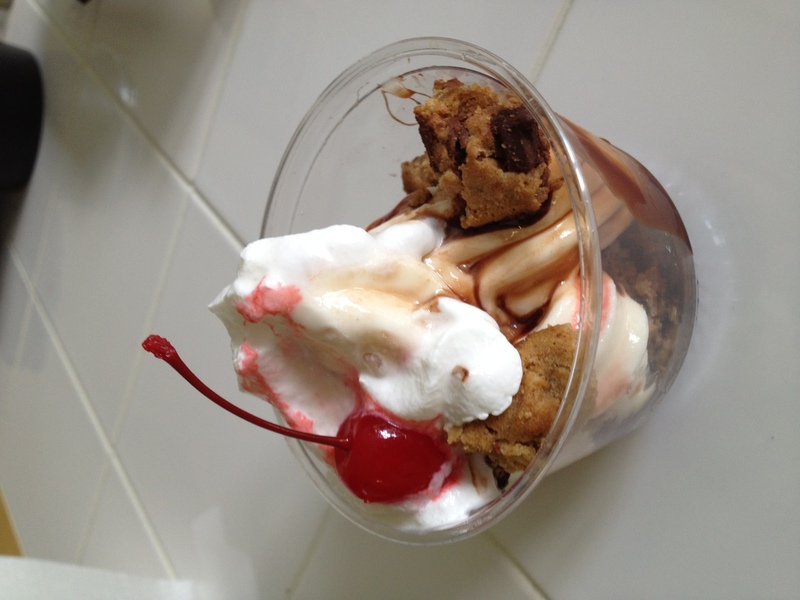 Whipped cream and cherry with more chocolate cookie chunks rounded out the simple dessert. Something I would expect from CFA. They take simple food and make sure it is solid and yum (that’s a technical term – yum). And yes, this sundae was the perfect sweet ending to my lunch. The cookie was soft, chewy, and loaded with chocolate chunks. Delicious. But, I want you to try for yourself. And though I paid for my lunch and sundae (the sundae is a mere $1.79! ), CFA and I don’t want you to. They want you to enjoy it all just because you are a reader of City Nom Noms. Talk about a deal. I have a numerous gift cards to give out to you! Each card gives you an opportunity to try a dessert every month, all summer long. How do you win a gift card? All you need to do is leave a comment telling me why you love CFA! Maybe it is the fantastic service you always receive, or maybe it is because you appreciate that they close on Sunday for their employees to have a weekend. Or, maybe you like the spicy chicken sandwich as much as I do. That’s it. And don’t hesitate to share the opportunity via twitter or Facebook. There are plenty to give away – I have a total of six cards for you to enjoy. Well, six of you! Note: the opinions of all restaurants are those of the restaurant and not mine. This giveaway is sponsored by Chick-fil-A to promote their new desserts. All Your Food Are Belong To Us.